Rarer even than the sight of a single Starship on a ramp these days is seeing a double. 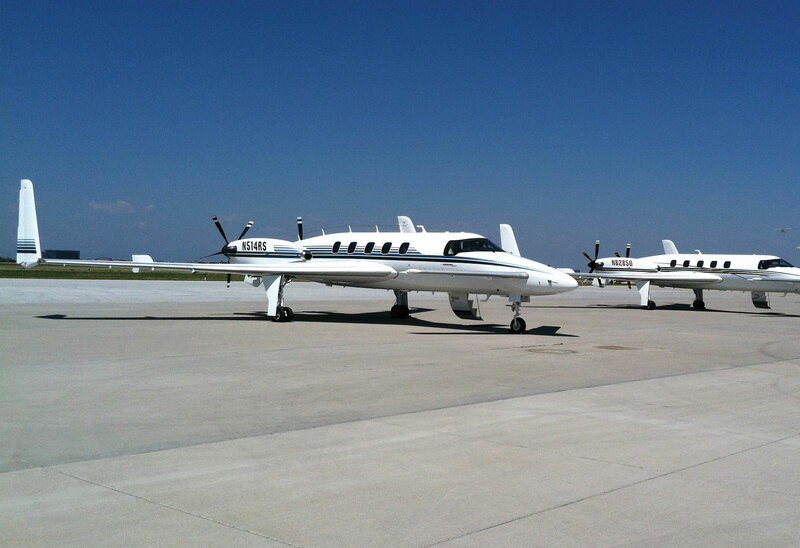 NC-50 and NC-51 sat side-by-side at Denver’s Centennial Airport last year when owners Robert Scherer and Raj Narayanan’s paths crossed coincidentally in the Mile-High City. This year marks the 25th anniversary of the entry into service for one of business aviation’s most enigmatic aircraft, the star-crossed Beech Starship, which was intended as a replacement for the King Air. As the first aircraft with an all-composite fuselage, the twin-turboprop pusher with radical canard forward design underwent a lengthy development and certification process before finally entering service. However, despite the airplane’s futuristic name, design and advanced engineering, the program was a bust for a variety of reasons: a debut coinciding with an economic downturn, a high purchase price on a par with that of entry-level jets and a top speed dragged below advertised specs by weight increases. Of the 53 Starships built before production ceased, only 11 were purchased by private owners; the remainder were offered on lease by then-parent company Raytheon Aircraft. Faced with the formidable cost of supporting such a small fleet, the manufacturer decided to pull the plug on the program and moved to decommission and destroy the aircraft under its control. As leases ended, the aircraft were flown to the Evergreen Air Center at Marana, Ariz., for parting out and incineration. Several were donated to museums, which promised never to allow the aircraft to fly again. Six other owners traded in their Starships as well. In the end, the majority of the fleet could be found at Evergreen nose-to-nose awaiting disposal, and Beech long ago stopped talking about the aircraft. Yet, a handful of Starships escaped the purge and are still racking up flight hours. According to the FAA, five Starships currently hold active standard registration, including one based in Germany. Their owners remain passionate about the aircraft, once derisively described by a former Beechcraft president as looking like a Klingon battle cruiser, and have gone to great lengths to keep them flying, long after their manufacturer left them virtual orphans. Of the remaining airframes, there are two categories: those that never left private ownership and those former Raytheon-owned Starships rescued from “death row,” which had their spars drilled, similar to decommissioned military jets. “Fortunately the hole they cut in the spar was not in a very critical or sensitive area,” said Raj Narayanan, senior partner and managing member for Dallas-based Aerospace Quality Research and Development-MRO, who owns a pair of in-service Starships. “It could be repaired,” he added, though it has never been done on any of the remaining airframes. He had conversations with the owner of NC-50, one of the few originally purchased Starships, who hadn’t flown it for some time and was interested in finding a home for it with someone who would maintain and fly it, which led Narayanan to purchase it in 2011. Since then he acquired and is in the process of fully restoring NC-33, which escaped “death row” with only the loss of its data plate. The aircraft was taken to Mexico by its previous owner and somehow registered, but when it returned to the U.S., the FAA pulled its airworthiness certificate and the airplane languished for several years in Kentucky. Narayanan subsequently bought it and currently has it flying under an experimental certificate. He also has two other complete airframes–sans engines (albeit with drilled wing spars)–in storage and has parted out two other decommissioned Starships to establish a pool of spare components, which occupies approximately 7,000 sq ft of storage space. In addition to flying the aircraft, Narayanan also serves as unofficial project engineer and chief mechanic, alerting the other owners to any support issues he encounters. His company has the equipment and capability to perform virtually all of the maintenance on the now-exotic aircraft, which allows it to do double duty as a flying advertisement for his firm’s MRO capabilities. He has also cultivated a support network among former Beechcraft engineers who had worked on the project, which shared a good deal of system commonality with the Beech 1900. A private pilot for more than three decades, Scherer was looking to upgrade from his Cessna 210 to something better suited for Rocky Mountain flying when he spied the lone Starship listed among the King Airs in Trade-A-Plane. After a test hop in the former Tyco International aircraft, he was hooked, and two weeks later he was the owner. He earned his multi-engine commercial and ATP ratings in the span of little more than two months and then paid for FlightSafety type-rating instruction for himself and his flight instructor, who drilled Scherer every night on the day’s information and helped him earn his Starship rating. Today, with business holdings in California, Colorado and Georgia, he puts several hundred hours on the aircraft each year and he expects the Starship to last him for the remainder of his flying career. To ensure that, in addition to the four complete airframes he owns in storage at Marana Regional Airport, in 2004 Scherer made a deal to acquire the entire remaining parts inventory– approximately $38 million worth–from Raytheonfor pennies on the dollar. They currently occupy one of his California warehouses, loaded on 18-foot-high pallet racks similar to those found in big-box stores, as well as a pair of packed 40-foot shipping containers. Scherer also sells to the other owners, but given such a limited pool of clients– one of whom (Narayanan) has made himself virtually self-sufficient–parts sales are spotty, he said. Some years he has no sales, but he’ll receive the occasional large order when one of the other owners has some major work done. Scherer has had NC-51 serviced by Martin Aviation at California’s John Wayne Orange County Airport. The technicians there have encountered few surprises with the aircraft over the past 16 years, he noted, describing it as in line with other Beech products and endowed with ample room in which to work. Scherer and Narayanan’s Starships are RVSM certified, allowing them to operate at their intended altitude–up to 41,000 feet. “It cost me $91,000, which ain’t cheap, but it paid for itself in gas already,” said Scherer, who obtained the certification six years ago. Both he and Narayanan plan to comply with the upcoming ADS-B equipage mandate on their aircraft. The Starship does face some obsolescence issues, particularly in the cockpit. Parts for the original Rockwell Collins AMS-850 avionics system are no longer made, and the manufacturer announced earlier this year that it would no longer be supporting the system’s database. Narayanan and others are currently in the process of certifying a replacement database using the same hardware. The aging CRT displays were also a problem, according to Narayanan, who recently found some places that could still repair them. Despite some discussion among the owners about upgrading to a modern cockpit suite such as the Garmin G1000, such a modification, if approved, would cost several hundred thousand dollars. “Unlike other airplanes, the Starship flies with the Rockwell Collins digital autopilot, and that autopilot is integrated into everything in the cockpit and the airplane overall, so you have to basically rip everything out of the airplane and redo the whole thing,” said Narayanan, who noted that parts for the environmental control systems are also a challenge for him. “Maintenance hog” and “noisy” are two unjustifiable labels assigned to the airplane, he believes. According to Scherer, the cockpit is so quiet that the only sounds heard in flight are the rushing of the wind and the tick of the Hobbs meter every six minutes. While the fraternity of Starship owners is a small one, both Scherer and Narayanan would gladly welcome new members. Another virtually intact Starship is rumored to have been stored in Tampico, Mexico, for more than a decade, and Scherer said he recently received an inquiry from a possible buyer looking for advice. One question that remains unanswered by the company that developed and certified the Starship is why, despite what seemed at the time to be a meticulous plan for eliminating the fleet, some Starships survived. Textron Aviation/Beech declined to furnish AIN with any documentation that would shed light on Raytheon’s instructions to Evergreen. According to Scherer, Evergreen believed it was not given specific instructions about the disposition of the airframes, and it is not clear if Raytheon ever actually ordered them all to be ground up.